Locals forsake a Laguna Beach winter for a true East Coast experience. 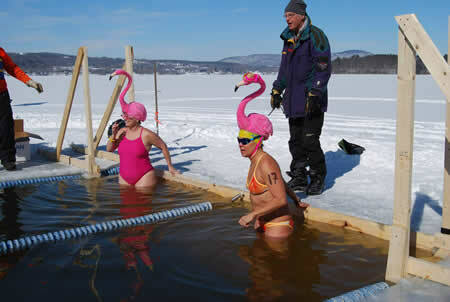 Three Orange County open-water swimmers represented Southern California in the annual Memphremagog Winter Swim Festival in Newport, Vt., last weekend. Laguna Beach residents Tom Hale and Lynn Kubasek, along with Scott Zorning of Coto de Caza, joined other swimmers from, Canada, Puerto Rico and four New England states to swim the glacial lake that spans both Quebec and northern Vermont. A tractor and chainsaws cut a 25-meter, two-lane pool into the 18-inch thick ice on Lake Memphre for the swimmers, who did not use wetsuits. The water temperature under the ice was 31.5 degrees. “The fun part is you have to cover all hair as any exposed hair may break off as outside temps can be as cold as 9 degrees with wind-chill dipping below 0 degrees,” said Hale, who swam with Kubasek and the rest of the Oak Streakers from Catalina Island to Laguna Beach in a relay last summer. Both Hale and Kubasek swam the 25-meter freestyle, finishing eighth and 26th respectively out of 33 swimmers. Both Laguna swimmers also competed in the 50-meter freestyle with Hale finishing 12th and Kubasek 26th out of 30 swimmers. Local Lynn Kubasek, right, improbably chose the same headgear as a competitor in the hat contest. The first event of the day was the 25-meter breaststroke and Best in Hat competition. Kubasek finished 14th with a time of 29.21 minutes, but was runner up in the hat contest, along with Amanda Hunt of Naperville, Ill., who coincidentally wore the same pink flamingo headgear. 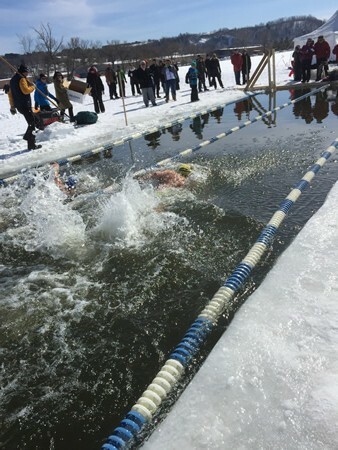 The Memphremagog Winter Swimming Society, various local businesses, the city’s recreation department and 20 volunteers organized the second annual event. Luckily the air temperature averaged a balmy 25 degrees. At a dinner and award ceremony, ice tongs were presented to the most “mature” swimmer and the person who had travelled farthest for the event.